As you look to furnish your business in the Atlanta area, you may be under the impression that your only option for accommodating all of your employees is to purchase cubicles. However, if your employees regularly work together on projects, collaborative modular office furniture may be an even better option. This modular office furniture is unique because, rather than placing high walls between employees the way that cubicles do, it’s meant to be connected together to create a team-oriented working environment where employees can interact with each other while working. 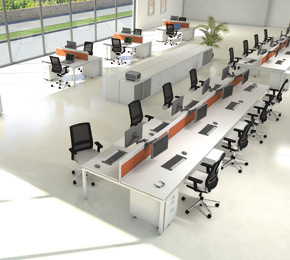 NorthPoint Office Furniture has equipped many businesses in the Atlanta, area with collaborative modular office furniture, and would be happy to help you determine if this type of furniture is appropriate for your business. For more information about the modular office furniture we have available for your business in the Atlanta area, contact NorthPoint Office Furniture today.